An all-familiar Family Guy cartoon becomes a smashing mobile slot! When we previewed the new Family Guy slot, we knew that it's release date – December 10th – will be a memorable day. Now, we know for sure that it's a day that will go down in history as the day when the most inappropriately fun and entertaining mobile slot was released, all thanks to IGT. 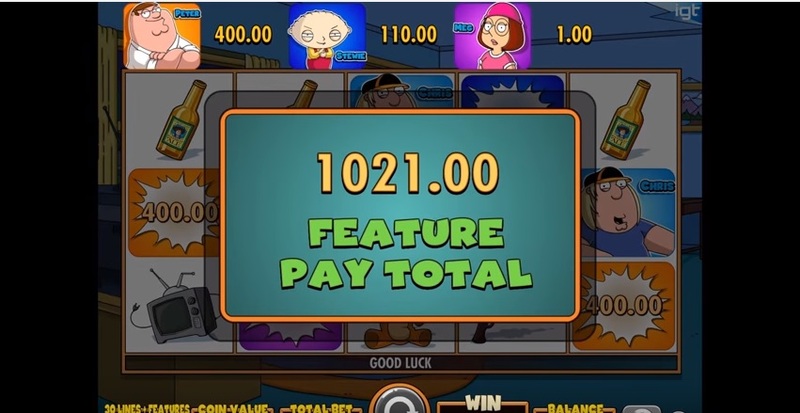 As every IGT slot, Family Guy started out its life as a land based slot machine, but thanks to it being so popular, the developers have decided to bring it onto our smartphone screens. Boy, we couldn't be more thankful for it! With so many awesome and hilarious features, this slot isn't just about winning, but it's about enjoying the process too. 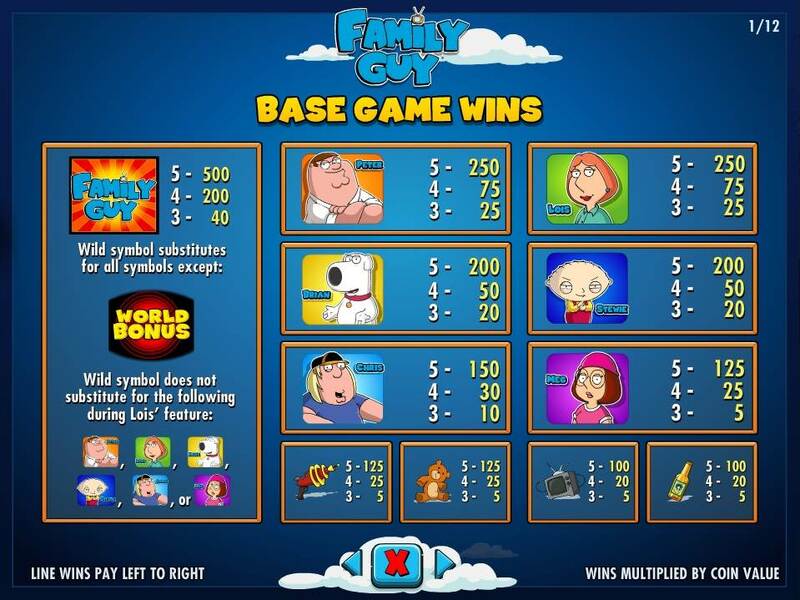 Read all about the features, the maximum payout and the highly amusing gameplay in this Family Guy slot review. It appears that IGT have succeeded in making a mobile slot that plays like a video game. With so many features big and small crammed into this gorgeous looking slot with massive win potential and famous characters, we think it will become a slot that you will seek out and play regularly in no time! Is It A Slot Or A Video Game? Blurring the line between video games and slots has been a trend long developing. For example, many of NetEnt releases are graphically beautiful, as are those by boutique developers such as Thunderkick or Elk Studios. So, it comes as little surprise that IGT would want to jump onto the bandwagon of video gamifying their slots to attract players. Personally, we love the overload in features as well as in little bits such as quotations or video excerpts from the TV show itself, but we admit that it might not be to everyone's liking. Even the features have sub-features and at times it can all feel like a little much, but it keeps us guessing what's around the next spin and in the two days that we've played the game, we've not gotten bored. Available as a land-based slot for years, Family Guy has finally broken into our smartphone screens and given the high-quality of this slot, we couldn't be happier! All of our favourite adult TV sitcom characters are featured in this slot and you can spend your days visiting Quahog and Rhose Island as well as playing with Peter, Lois, Meg, Chris, Stewie and Brian – or just your favourites then. The slot itself is adorned with symbols of the famous family itself, as well as other recognisable Family Guy icons such as Stewie's teddy or the family TV set. Overall, the graphics are exceptionally slick and HD – IGT have done a splendid job at creating a slot that will become as iconic as the TV show itself. Randomly, various famous quotes are displayed at the top of the slot (e.g. Chris' ‘there is an evil money in my closet') and video segments play after a particularly big win or after a feature. Although you can skip them, we always find it fun to re-watch hilarious bits of the show! Alright, But What About Wins? It might look good, but if it ain't paying, we ain't playing…Or something like that. Well, fret not because Family Guy slot by IGT not only looks superb but also has plenty of financial incentives. After they lure you in with the highly inappropriate yet hilarious TV show theme, you're half way to riches, because the return to player is at a very healthy 95.5%. The game is of medium variance which means that there are moderate and large wins that come sometimes, and there isn't much bother about providing you with many measly wins. Despite that, the maximum payout of 12,5000 coins in regular gameplay and much, much more through the plethora of features should be more than enough to tempt you. Plus, the game is designed not to let you go through long and winding losing streaks, because it gives out wins at regular intervals. That's a nice Christmas present from IGT and we can safely say that the software developer has raised the bar high for all the other branded slots which are coming out next year, such as the Guns N Roses of NetEnt (which also looks to be a feature-packed slot). Yup, the slot is definitely feature heavy and they're quite crazy also. Watch out for the World Bonus symbols, three of which on reels 2, 3 and 4 will take you through to the World Bonus. Although this bonus does nothing in itself, you will spin the Wheel of Fortune of sorts with Stewie and then will be awarded one of the three bonkers features. Drunken Clam Bonus – set in the famous watering hole in Quahog, the Drunken Clam bonus will allow you to choose one of the four characters to reveal a multiplier from 25x to a whopping 1,000x your bet. The longer your chosen character stays up and doesn't topple down drunk, the bigger your multiplier. You also get to select beer taps which pour multipliers from 5x to 750x and if a tap displays the Win All sign, then you get all the multipliers from all the taps added together. Plenty of incentives to stay the last man standing in all this stupor. Chicken Fight Bonus – you might have a recollection of this famously hilarious scene in the show and IGT have gone and made it into a feature! In it, Peter gets into a fight with a massive chicken. You get between one and seven picks in each of the three rounds of the fight to place your bet as to who will win and gain multipliers from 5x to 1,000x. Lois Hot Extra Spins Bonus – lastly, there is the hot mama Lois – trigger this bonus and you'll get 10 extra spins that can be re-triggered and more spins can be added with the Giggity Retriggity symbol on reel 3. You should also look out for the Wild Heart symbol, because when those land on the last reel, they will fill up four meters of three symbols each, making one of the four coloured Lois symbols Wild. So, when all three hearts are filled out, the Lois will become and remain Wild for the rest of this feature. And Meg? Nope, no Meg feature. No one likes her anyway, amirite?! Want to play Family Guy? Family Guy is absolutely stuffed with exciting features and has top win potential! Family Guy Alright, we're done with the features and we're on to our conclusion! We hope that you didn't get lost in all the features, sub-features and the little mini features within features... You can tell that IGT have done a great job at packing as much excitement and action into this mobile slot as possible. Not only that, but they've gone and put in plenty of opportunities to multiply your wager by a thousand - not a small thing at all. So, do we like the slot? We love it. We love the classic character quotes, the video snippets that are played after features, the randomly triggered features and the ones triggered via the World Bonus wheel spin with Stewie. We love all of it almost as much as we love the TV show itself. Call us flashy, but we enjoy the fact that this machine closely resembles a video game and you will like it too if you enjoy the Family Guy show. But even if you don't, then there's plenty of cash to be won and plenty of giggles to be had in this hilarious video slot. We foresee great popularity for this IGT machine and thus award it five out of five stars! NextTwelve Days of Cash Drop at Sapphire Rooms Casino!